Years ago, I built a website for a woman named Wilma Duncan. She is the author of this article. The site has since been taken down (Wilma’s the Cause, a non-profit that gave aquariums to classrooms, nursing homes, etc) but I wanted to keep her articles up and on the web…so here is her article about snails. What can you keep in your aquarium besides fish and plants? Lovely snails. Except for a few species, most snails benefit the aquarium habitat. How is this possible? They are great cleaners, eating uneaten food, dead plant material, and consuming algae. They are a great food source; just watch a clown loach as he devours them. My favorite snails are the red, gold, and brown ramshorn, and Malaysian. I use these in all my fry tanks, from egg layers to livebearers. They will not harm fry as they clean up the uneaten food and consume any algae that forms. They are a handsome snail, reaching the size of 2.5 cm or so. Their shells take on a flat coil appearance. The Malayan snail (Melanoides tuberculata), small brown-shelled conical snails that burrow and help keep the substrate sweet and healthy. Rarely seen during the day, but come out at night and may be culled then, as they tend to over populate. They are carnivorous and eat decaying vegetable matter. I use these in my fry tanks for clean up. Beware of the Japanese livebearing snail (Viviparus malleatus), as it grows large and dangerous if it dies in the aquarium.Remove it promptly! The mystery snails are a variety of colors. Blue, gold, albino, cinnamon, and black are the most common found in the aquarium trade. 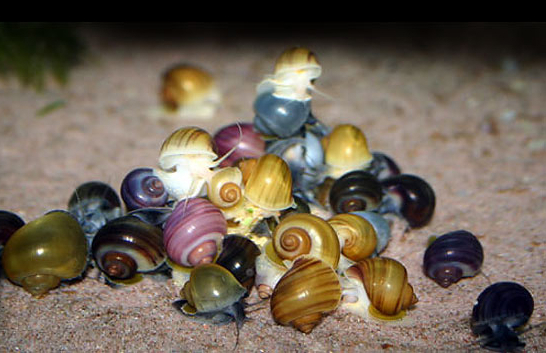 The Gold Mystery snail (Ampullaria cuprina) can be housed with any fish that does not eat snails. It is not a live plant eater, only decaying plants and will eat any type of fish food. I have been told, if fed canned spinach, growth rate is astonishing. I have not personally tried the spinach. They are hermaphroditic, meaning each snail is male and female. The eggs are laid in a finger size cluster, consisting of a couple hundred eggs above the water line. If the babies are fed well they can begin laying eggs within four (4) months. I collect and keep the blue, gold, albino, and black mystery snails. The Olive Nerite snail is one of the greatest algae eaters I have seen. You can place one in a tank in which the glass is coated with algae and within a few days the glass is clean.